In my pregnancy yoga classes, we used to have a 10 minute ‘to be mommy’ group chat. Though I had heard of constipation, ‘hemorrhoids’ was a new term for me. “Take care of yourself ladies. Trust me, you wouldn’t want to get this” is what a friend in the group said. Pregnancy is a 9 month journey for a beautiful ending and the path is always not so great. Well, you start with the initial tiredness, fatigue, morning sickness, 100 million times of loo visits, pigmentation (well, some glow during pregnancy and others find another heart breaking issue). You will turn dark, round/plumpy and by the 6th month (for some much before that) starts the back pain. The villain among all these is ‘constipation’: the dreadful one among all these inconveniences! Constipation later could develop into hemorrhoids to make things worse. What is constipation during pregnancy? Pain in the abdominal area or discomfort or difficulty in bowel movements is termed as constipation. At least 50% of pregnant women suffer from constipation. 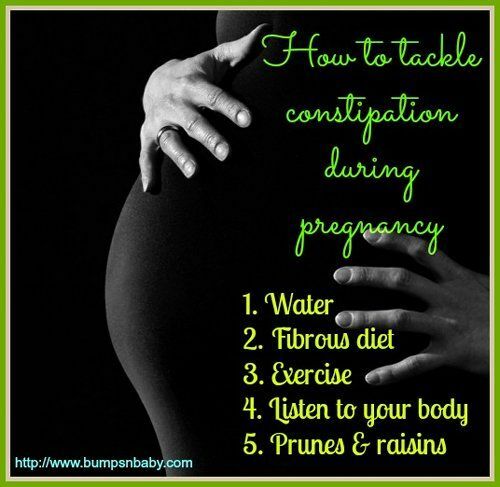 There are various causes for constipation during pregnancy. Excess of intestinal water absorption: When the food stays longer in the intestine, more water is reabsorbed from the bowel back into the body. This causes the constipation. Iron supplements: Usually the iron in the prenatal supplements can slow down the elimination of wastes from the body. For normal people there are various medication available for constipation. Though medication is available even during pregnancies, it is always better to avoid constipation by taking care of our routine in a healthy way. Check your iron levels in blood and if you find you have enough iron content, take a prenatal tablet with less iron. You can always ask your gyno to prescribe supplements with DHA which is a stool softener. Too much of iron absorption also results in constipation. It is always advisable to check with your gyno if the condition lasts for a few days rather than treating it yourself. Laxatives have to be avoided completely if you ever take medication during pregnancy, as they might stimulate contractions. Following are the best preventive methods or ways to initial treatments options of constipation during pregnancy. This is the first and foremost thing to do to avoid constipation. I totally understand and have gone through the never ending loo visits because of drinking water. But you need to drink 1.5 to 2 liters of water daily. As soon as you get up in the morning drink 1 full glass of luke warm or plain filtered water. Diet is one important thing to be taken care of to avoid constipation. Please include lots of green leafy vegetables, fruits and high fiber foods like whole grain in your everyday diet. Avoid extra spicy, deep fried and junk food as much as possible during pregnancy. Fibrous foods like oats are one of the good sources to prevent constipation. As I told in the beginning, my friend blamed the spicy food she had for hemorrhoids. You can also read about the healthy diet chart for a pregnant woman. Is it safe to have green tea during pregnancy? Do not push or strain yourselves if the bowel movement is not fine especially during pregnancy. It may complicate the situation. It is equally important that you go to the restroom whenever you feel the urge to do it. Wash and soak raisins overnight and drink the water very next day. This is one of the proven home remedy by one of my close friends. Prunes are also told to have the same constipation curing power like raisins. Exercise can help a lot in clearing out the wastes from the body. Indulge in walking, yoga or any other physical regular movements on an everyday basis. Hope my article on constipation during pregnancy is beneficial for you. Please share your views and feel free to add in comments any preventive methods/home remedies for constipation during pregnancy if you know. If you want to stay updated on many more articles like these, please subscribe to the newsletters of Bumps n Baby. Next Article How to Take Care of Babies During Winter?